Could you tell me how to gently clean the fabric/foam inside my motorcycle helmet? Specifically, it has a buttload of foundation, powder, and blush on it. Sometimes I worry that I don't tell you often enough how proud you all make me. It's a thing I should tell you more often! Because I get all these amazing emails and tweets and comments from people that I read an am like, "Oh wow, they've been paying attention! THEY'VE BEEN PAYING ATTENTION!!!" It's thrilling when I'm reminded that people are paying attention, especially because I know it's a harder and harder thing to do in this day and age, to wade through all of these words separated by nary a GIF (hard G) nor presented in listicle form. Now then, some of you may be wondering what the tell is in this particular question and I will, um … tell you. Our LW framed her request by asking "how to gently clean the fabric/foam inside a motorcycle helmet." Not, "HOW DO I BLAST THE MAKE-UP CRUD OFF MY HELMET??" I've actually given general helmet washing instructions in a post about cleaning hockey pads, so let's revisit those quickly before we get into the specifics of what to do about those make-up stains, which can oftentimes be their own beast separate of the grime and smell that can build up on helmets of all stripes. Helmets can be washed with a sponge and a small amount of mild detergent or shampoo. The trick to this is to make a bowl of water and shampoo, dip the sponge into that solution, wring it out very well, and wash the helmet with the suds that process creates, rather than with a lot of water. 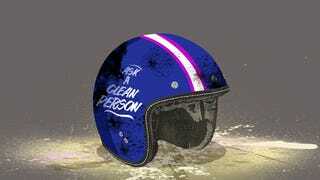 Once the helmet has been washed, repeat that process with clean water. Dry it off as best you can using a towel and then allow to air dry completely. I'll add to those instructions that a washcloth is a good alternative to a sponge when it comes to giving the old helmet a scrubbing. Oh also! If you live in an area that is damp and/or humid and you want to speed along the drying process, pointing a fan at the helmet's lining will help. You can also ball up a dry towel, insert it into the helmet and leave it for an hour or so before removing and letting the helmet air dry—the towel will help to absorb excess moisture. Now then, let's talk about those make-up stains specifically. It's likely that the shampooing will take care of those stains. It's equally as likely that the shampooing won't get all of the make-up staining out of the helmet's foam lining. But you know what's great on make-up stains? Rubbing alcohol. So if you do find yourself with residual make-up staining after giving the helmet a shampooing go ahead and swab the stains with some rubbing alcohol applied to your sponge or washcloth. A cotton ball or something similar is also fine. Make-up removing wipes are another way to go—just be sure that they're the oil-free kind, or else you'll end up swapping those make-up stains for oil stains. Can you help us figure out how to get rid of this terrible smell? We purchased a car recently that smelled like cigarettes when we test drove it. The dealer said he would detail it, which to ME means cleaning the vents and crevices with Q-tips dipped in white vinegar but to HIM it meant spraying the crap out of our car with fake new car smell. We even had to clean the car after we got it home, it was disgusting! I keep telling the hubby that we should use vinegar or baking soda to remove the smell but he doesn't believe it will work. Do you think it will? If so, how do we go about using them? We are both really sensitive to chemical smells and use unscented EVERYTHING, so this is really annoying to have a car that makes our clothes and belongings smell like cheap perfume. Please help, I'm tired of stinking like cheap incense! Okay, a few things to discuss with this one. The first item being that I think you should take the car back to the dealer and tell him the smell is still unacceptable. You can be nice about it! Maybe he meant well? If the dealer is willing to detail it again, great. If not, there's a pretty cheap and easy way to remove that incense-y smell. But before we get to that, let's talk about your baking soda and vinegar approach. Yes, it will work. No, it's not what you should do. Here's why: It will take so much time and effort on your part that it would be bad form for me to suggest it, when the aforementioned cheap and easy ways exist as an alternative. Really the best way to go when you're dealing with any sort of car smell that you want gone is to get an odor absorbing product, stick it in the car and let it do the work for you. Now, by "odor absorbing product" I don't mean things like those rearview mirror trees. I mean things like The Bad Air Sponge or the Innofresh Auto Odor Eliminators, which rely on activated carbon to do their thing. [Disclosure: Innofresh provided me with product samples.] I've recommended both products to readers over the years to help get rid of odors like mildew, spilled milk and, of course, barf. (There's allllllllllways barf with you people.) (Never change.) Everyone who's tried them raves about how well they work, so that's what I think you should stick with. Leave the baking soda and vinegar for your drains.